Alright you outdoors adventurer, you; now that you’re finally slowing down, shaking the lake water out of your hair and kicking the trail dirt out of your sneakers, your summer-kissed skin needs a little attention. Dryness; scratches, cuts, and bites (which lead to scarring); and acne are the most common skin issues among nature enthusiasts. So after a few months, weeks, even a day, out in the elements your skin is going to need a nutrient-rich boost. 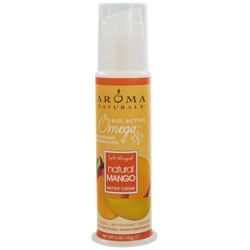 In other words, some Aroma Natural Omega X Mango Butter. Sooth and nourish your skin back to health with this rich cream containing natural mango butter, organic coconut water, and organic aloe vera gel for quick hydration that helps to restore long lasting moisture to your skin. To retain the health benefits of each ingredient they are combined using Cold pHusion, Aroma Naturals’ new Green Chemistry technique where little or no heat is applied to make their creamy emulsions. Perfect for all skin types, Omega X Mango Butter creates a natural looking protective finish -- without the greasy residue -- and can be used under makeup. Mango Butter is rich with vitamins that serve as natural UV filters combating free radicals found in the sun’s rays, actually protecting your skin from sunburn. But let’s say you’ve already been sun-kissed, well then the vitamins will serve as a moisturizer to soothe your sunburned skin. Aloe Vera, speaking of sun-kissed skin, contains auxin and gibberellins, two hormones that ease inflammation. But it’s not just sunburn this extract works on, aloe vera is also known to stimulate cell growth in turn healing heal chronic skin conditions, such as psoriasis, acne and eczema. Coconut Water will most certainly quench any dehydration your skin has experienced this summer. Loaded with anti-viral, anti-microbial, and anti-fungal properties it also protects the skin from any germs looking to make their way through dry, cracked skin. Sweet Almond Oil is swirling with calcium, potassium, magnesium, and vitamins E and D, the secret ingredients of scar reduction and stretchmark prevention. Pomegranate Oil contains punicic acid, an omega 5 fatty acid, which is known to hydrate dry skin and prevents moisture loss. Their ingredient sourcing is no joke. Aroma Natural’s food grade quality ingredients are sourced from around the world and flown in to their U.S.-based factory daily. They’ve chosen to only work with companies that are transparent, responsible, and respectful of their people, the quality of their products and processes, understand and participate in sustainability and ecology improvement plans. So much so that cool fact about the label; it’s printed on a water-free and tree-free material. Don’t get us wrong, yeah, the supply chain is not perfect yet, but with caring about doing the right things, Aroma Natural is helping make a difference every day -- and we’re not just talking about when it comes to soft skin.